The Colorado State Fair is a wonderful tradition of FUN! With the best headline entertainment, livestock shows and sales, commercial and art exhibitions, a huge rodeo and carnival, among many more free attractions, the Colorado State Fair admission ranges from$7-$10 with children under 6 free. 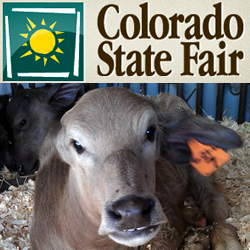 Visit the Colorado State Fair with your family and tell all of your friends – its a huge Party! Tags: Childrens Activities Pueblo Colorado, CO State Fair, CO State Fair Events, Colorado State Fair, Event Schedule Colorado State Fair, Find things to do with Kids in Colorado, Kids Event State Fair, Kids Events Colorado State Fair, Pueblo CO Events, Pueblo Events, Pueblo Kids Activities, Pueblo Kids Events, State Fair in Colorado, State Fairs, Things to do in Pueblo Colorado, Things to do with Children in Pueblo, When is the Colorado State Fair? Tickets to the Colorado State Fair, Where is the state fair in Colorado?